I've always been intrigued by Calgary's downtown core and wished it were easier to navigate as a family. Urban parks, sculptures and playgrounds all wait to be explored by those who can figure out how to reach them without fighting congested roads and crowded sidewalks. I was therefore very excited when I heard about a new guidebook that would demystify the process of navigating the downtown core while offering straight forward ways of biking through the crowded streets and pathways. 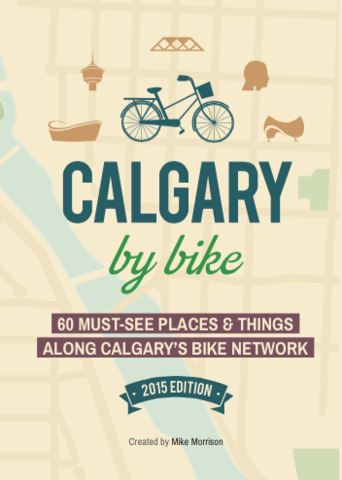 Calgary by Bike is a small guidebook written in the form of a map you can fold up and carry in your pocket while biking around downtown. It is written by popular Calgary blogger, Mike Morrison of Mike's Bloggity Blog and the map costs slightly more than a cup of coffee at $5. Last week, my 6 year old son and I grabbed the new map, loaded up our bikes, and headed down to Prince's Island to begin our first journey on Calgary's Cycle Tracks. Our first goal: To bike from Eau Claire Market to 17th Ave. for lunch on a patio. Second goal: I wanted to see the Chinook Arc sculpture that I'd never seen before. Third goal: We wanted to do a loop of downtown and somehow connect the cycle tracks to the river pathway via the East Village. We parked at the Calgary Curling Club at 3rd Street NW and Memorial Drive with its easy access to the bridge leading to Prince's Island Park. Parking was cheap and we paid less than $5 for the three hour period that we were downtown! There was also ample parking and it was no challenge at all to find a spot. From Prince's Island Park we made our way to the Cycle Tracks on 7th Street SW and followed the them to 8th avenue SW. Once we reached 8th avenue, we followed the Cycle Tracks over to 5th Street SW and then biked all the way down to 17th avenue. The Cycle Tracks were easy to follow and completely safe for families riding with kids. They were separated from traffic and I never worried about getting hit. The only challenge with following the cycle tracks was that we had to stop at most intersections to wait for our light to turn green. Vehicles, cyclists, and pedestrians all share the intersections at each block so obviously you will be doing a fair bit of stop and go riding. While not a problem, it just means that families really need to make sure all kids will stop at each intersection without riding straight out into traffic. For more on Calgary's Cycle Tracks,visit this link to the City of Calgary's website. The Ship and Anchor is a Calgary landmark with its sunny patio located right on 17th Ave and I love that they accept children at this pub. The Ship and Anchor is visible from the corner of 17th Avenue as you reach it by bike. Just turn left (east) from 5th Street and lock your bikes up at the bike racks located beside the patio. While the pub doesn't have any kids' menu, we found the Mac. and Cheese to be delicious (hold the jalapenos) and next time I'm ordering it myself! Meanwhile, I ordered a Vietnamese inspired noodle dish to go with my beer and we chatted with friendly locals while enjoying our lunch. I've seen most of the big sculptures downtown but had never even heard of the Chinook Arc until looking at the Calgary by Bike Map. Located on 12th avenue SW, it was an easy ride via the Cycle Tracks and we stopped here on our way back to 8th Avenue. 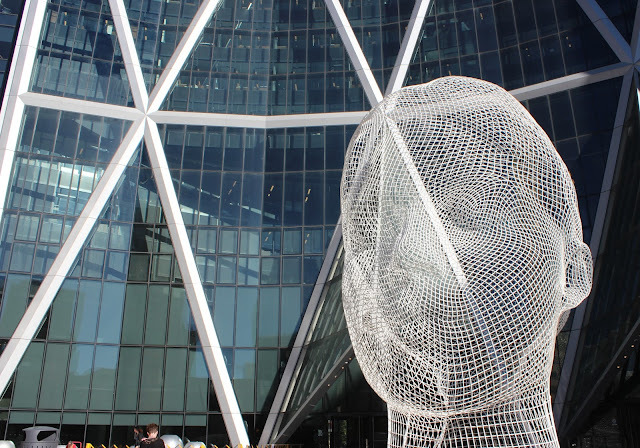 Other sculptures are easy to find on the map as well with a picture showing their location in the downtown core. From Olympic Plaza, the Cycle Tracks are located on a shared sidewalk as you proceed south towards 9th Avenue so care is required again, lest you hit some unsuspecting tourist. We made our way down to 9th Ave SE and rode on a combination of sidewalks and shared road. I was a bit nervous riding in traffic along 9th avenue on the shared car/bike roadway but the vehicles all respected the marked bike lane and we made it to the pathway across from Fort Calgary. Once on the pathway, the East Village was in front of us and we would have an easy ride back on the Bow River Pathway. We had a pleasant ride on the paved Bow River pathway (also known here as the "River Walk") heading west back to Eau Claire Market. Next time we'll stop at the newly renovated Simmons Building for coffee and pastries at the bakery, and as soon as my husband and I get a "date day" I want to go to the new Charbar Restaurant with its beautiful patio overlooking the Bow River and East Village area. We love going into Eau Claire Market for cinnamon buns at the Good Earth Bakery. YUM! There's so many other sculptures that would be fun to check out on our bikes. Of note, "Wonderland" definitely needs to be visited next time. The only challenge will be biking on sidewalks for a short stretch to reach it. 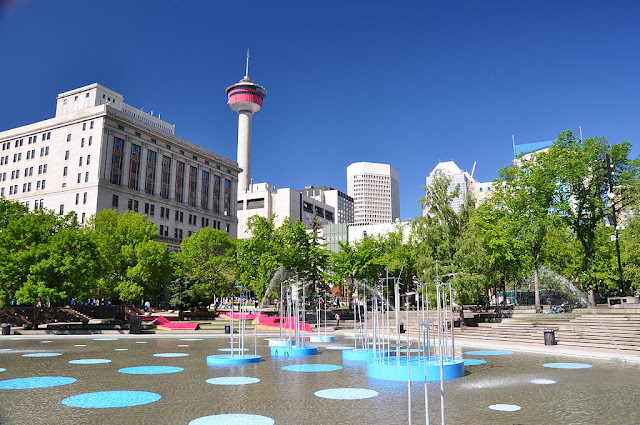 I'd like to actually play at Olympic Plaza next time and splash around in the pool. We didn't get a chance to play at the Eau Claire Splash Park and Wading Pool this time. I want to bike to Central Memorial Park on our next ride to play in the water fountains there. I'd also love to grab lunch at the Boxwood Restaurant located in the park. This park is super easy to reach via the 12th Ave Cycle Tracks. And hopefully next time we go downtown, the newly renovated St. Patrick's Island will be open! Check out the project here. 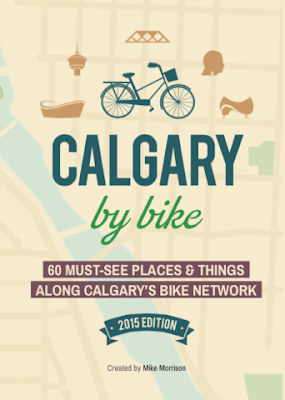 Visit the Calgary by Bike website or buy a copy at one of these stores. He definitely loves maps Andy! I have read your post. thank's for sharing. your pic is very nice. Awesome post. Most informative. Thx! My partner and i has been somewhat stressed driving inside targeted traffic alongside 9th opportunity around the contributed car/bike roadway nevertheless the autos almost all respectable the particular noticeable cycle side of the road and also we all caused it to be for the walkway around coming from Ft Calgary. This is PERFECT article foe me! Great post. Important blog post and images. This post are really informative.